Each year, the candidates for student government leaders for the Associated Students of Seattle Pacific pull out all the stops when it comes to creative campaign advertising — and the year pictured was no exception. Can you guess the year this photograph was taken? Send in your answers by April 1, 2015, and you will be entered into a drawing to win an SPU sweatshirt! We’d especially love to hear from you if you recognize yourself in this photo — but any correct guess will be entered into the drawing. Contact us at spu.edu/response or response@spu.edu with your answer. 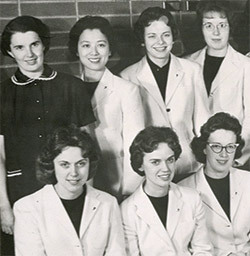 Many readers wrote in to identify the Falconettes, Seattle Pacific’s longest-running female service organization, and their advisor, Janet Burns Buck ’55, professor emerita of mathematics. Alumnae Falconettes maintain strong ties to SPU, participating in service projects, praying for missionaries, and supporting current Falconettes through scholarship endowments. It’s no surprise, then, that many of our respondents were Falconettes themselves, including our contest winner, Barb Goodwin ’74, a former president of the club. Congratulations, Barb! If you have historic Seattle Pacific artifacts, keepsakes, or documents that you would like to contribute to the University Archives, or if you have any questions about the Archives, contact Adrienne Thun Meier ’04, university archivist, at 206-281-2422 or ameier@spu.edu. 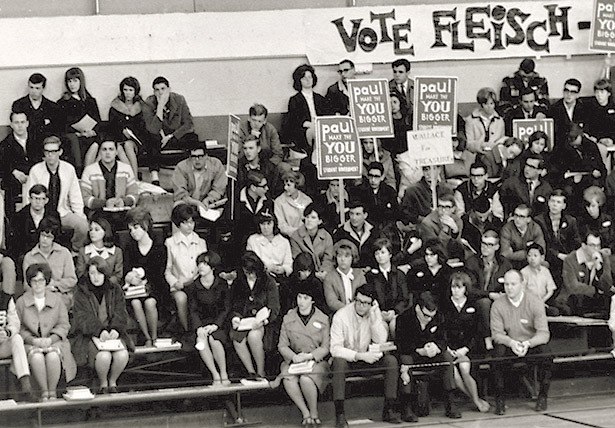 What year was that photo of student candidates was taken? If you can tell us what year the photo of SPC student candidates was taken by April 1, 2015, you will be entered to win an SPU sweatshirt! And if you have a story you want to share about your time in the Falconettes, let us know. We’ll post those stories below.